Most young children today attend some form of pre-school before entering Kindergarten. What makes a Montessori program unique? Maria Montessori was a pioneer in the field of early childhood education. She advocated for using child-sized chairs and tables, mixed age grouping, peer teaching, an organized and well maintained classroom environment, hands-on learning, intrinsic motivation, allowing children choices, and teaching self-help skills to allow for independence. These concepts are now considered best practices in early childhood education. 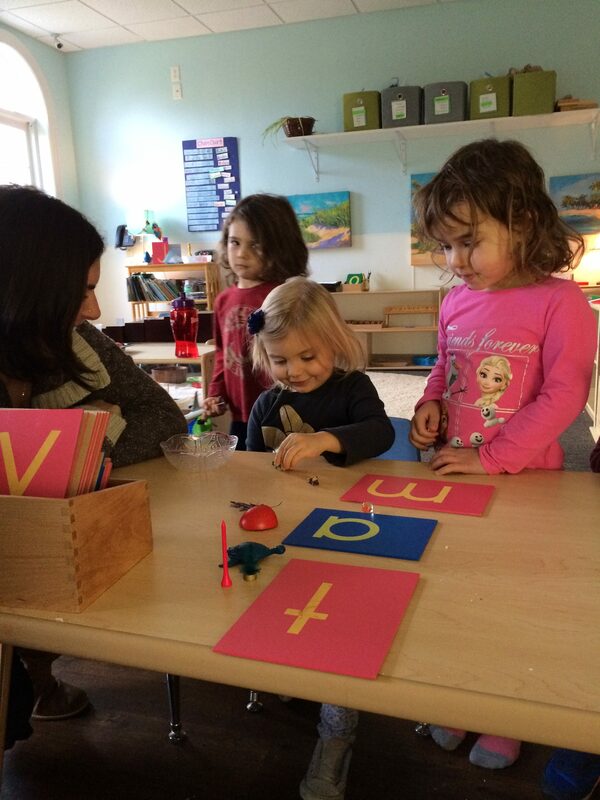 Mixed age grouping is one of the most obvious differences between a Montessori program and a traditional approach. The age span for a Montessori pre-school classroom is 3-6. There are materials in the class that are appropriate for children entering at age 3 and lessons that go beyond a typical Kindergarten curriculum for those who are ready for more advanced work. The needs of children with delays as well as children with advanced skills can be met as the children are allowed to progress as their own pace. Teachers use age as a guide line, but lessons are presented to students based on their readiness. The teacher knows that that child is ready for that particular work when a new lesson is presented. Children can move as quickly as they are able through the curriculum or take as long as needed to master a skill before being expected to move on. Younger children can learn by watching what an older child is doing. Younger children are motivated to master their skills so they can eventually do the work they see the older children doing. Some parents of Kindergarten age children fear that their child will be bored if they stay in the Montessori 3-6 class as a Kindergartner – that they’ve already mastered all there is to offer in that class. In keeping with the Montessori philosophy of following the child and presenting learning opportunities based on readiness and not age, Kindergarten children thrive as the oldest children in the class. There are numerous lessons in all the curriculum areas that are challenging for the older children as they progress from concrete to abstract thinking. Mixed ages allows for a lot of peer teaching. Older children often help a younger one with their work. Not only do the older children excel academically, they develop a positive self-esteem and their self-confidence soars as they become the class leaders and role models. The “prepared environment” in a Montessori classroom is a priority. Some pre-school classrooms are visually over stimulating and cluttered. The walls in a Montessori school are not covered with posters and lessons are rotated throughout the year to provide variety without over-crowding the shelves. Lessons are organized on the shelves in sequence from left to right in order of difficulty. Part of presenting a new lesson is making sure the child knows how to put the material away so that it is ready for the next person and where it belongs on the shelf. Therefore they always know where to find their work. Care for and respect for their classroom is part of the curriculum; children learn to carry one thing at a time using two hands, to walk around a classmate’s work space, push in their chairs, clean up spills, etc. A Montessori classroom is child-centered vs. teacher centered. Children of different ages are working at different levels so they aren’t all doing the same thing at the same time based on a teacher’s lesson plan. They spend most of their day working with self-chosen lessons. Once a child has had a lesson he can choose that work on his own. Children have uninterrupted work cycles so they can spend as much time as they want on the work they choose. Children aren’t moved as a group from center to center based on a time clock. Children can see and correct their own mistakes using the built in “control of error”. For example, when working with 0-9 counting, there are exactly 45 objects in the lesson so at the end, if there are objects left after counting out 9 or not enough to reach 9, the child knows to go back and see where he miscounted. Children learn by repetition. Continued use of the materials allow the children to master concepts and skills using hands-on manipulatives. They aren’t just memorizing information that they may or may not understand. Most of the day the children are working on their own or in small groups, freely moving around the classroom and conversing with classmates. However, it is important for them to also learn to be part of a larger group. There are times throughout the day when the class comes together and the children are expected to pay attention to story time, enjoy music or a group lesson while sitting quietly. Group times are kept short and age appropriate, respecting the fact that this is difficult for some youngsters. There is freedom but within limits. Children are self-directed but are expected to abide by basic ground rules for proper school behavior and safety. They learn respect for each other, respect for their classroom and the environment, good manners, putting away their work and cleaning up after themselves, walking indoors, taking direction from an adult to name a few. To develop good work habits and tenacity, children are expected to finish what they start. One of our goals is to help children develop intrinsic motivation vs. behaving or completing work for an external reward such as a sticker. Dr. Montessori coined the phrase “absorbent mind” to describe how effortlessly and joyfully young children learn when placed in a calm, stimulating, age-appropriate environment. Montessori teachers are trained to recognize the tremendous potential of young children and to expose them to a wide variety of learning experiences across the curriculum areas to prepare them for first grade and beyond. © 2017 Discovery Preschool, All Rights Reserved.